As many as 10 students are affected by missing checks for scholarships from the NMSC. Sometime during the first two weeks of the month, roughly eight to 10 students looked at their bills for the semester to find an unpleasant surprise – their National Merit Scholarship Corporation awards had not been applied to their bills. 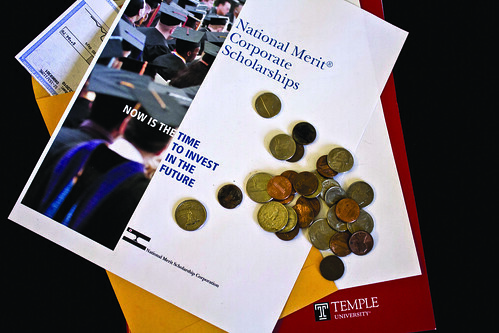 Photo Illustration SEAN O’BRIEN TTN The National Merit Scholarship Corporation puts stop-payments and resends new checks in cases like Temple’s. Under normal circumstances, NMSC would mail checks to the Bursar’s Office, which receives all scholarship checks from any entity outside Temple, once a semester, where the money is then processed by Student Financial Services and then added to the students’ bills. Under normal circumstances for the students, TUpay would list the amount of money owed on the bills as zero, but this time the amount of money owed was listed as the exact amount of money their scholarships were worth. Because scholarship information falls under academic records, the identities of the students involved as well as the dollar amounts of the scholarships are confidential. One student, upon discovering this, called SFS to inquire about her scholarship and was referred to Pamela Watters, a senior financial aid counselor at the Bursar’s Office. From Watters, the student learned that for some reason, the NMSC checks were not accounted for. “The weirdest thing is that a number of students come in and say checks were lost. Generally, lost is not in our vocabulary,” Kimberly Taylor-Benns, associate director of SFS, said. “If a student calls and says ‘I’m expecting this money. Where is it?’ and we get those calls everyday, usually we’ll refer the call to Pam Watters. “She’s one person handling outside scholarships for 37,000 students,” she added. Watters declined comment, electing to have all questions answered through Benns. One student told The Temple News NMSC provided a confirmation message and number stating the checks had been mailed to Temple in January, meaning the checks had not been accounted for nearly two months. Benns said she was unaware of this situation regarding the checks from NMSC prior to being contacted by The Temple News before spring break. After she was contacted, she researched and spoke to various department heads to figure out what happened to the checks. Benns said SFS was unaware because all matters concerning checks from a third party are handled by the Bursar’s Office. “They were never received by the university, after researching and asking all the way up to [Senior Vice Provost] Bill Black, [Director of SFS] John Morris and [Director of the Bursar’s Office] David Glezerman. All offices collaborated. The checks were never received.” Benns said. “Our associate director, Kathleen Richards, contacted the National Merit Scholarship agency, and they said we have to re-request the checks and that has since been done. “They have not given us a date yet as to when the checks will be released to the college,” she added. Benns also cites students as another reason for the delayed reaction. NMSC has a set procedure in place in the event a university, for any reason, does not receive checks from them. “We have around 20,000 students, so things like this may happen,” Rasa Samlkaitis, director of scholarships at NMSC, said. If either a student or official at a university calls NMSC saying that they have not received their checks, the agency will place a stop-payment – a request to a bank not to honor affected checks – on them. “We can request a stop-payment from the bank easily,” Samlkaitis said. After the stop-payment is issued, NMSC will send another group of checks in their next “check run.” NMSC sends out checks once a month all at one time, meaning if Kathleen Richards notified NMSC that Temple had not received their checks in March, the university will receive the new batch of checks in April. Neither Benns nor Richards could be reached to confirm this. Samlkaitis could not comment specifically if this is the case with Temple, citing that the information was privy only to the students involved or officials at the university. In the meantime, the students involved have to deal with concerns about holds on their accounts or dropped classes, which are typical consequences for not paying bills. Benns said these students should not have to worry about that. Watters also told one student via e-mail that she will take care of any holds or restrictions placed against them. As of press time, neither of the two students who spoke to The Temple News reported a check being applied to their accounts. They did not receive notification of when their money will arrive. I am not from Pennsylvania, and it’s ridiculous that residents throughout the entire 45,308 square miles get in-state tuition.